St. Martin's Press, 9781250124951, 208pp. "Bored and Brilliant shows the fascinating side of boredom. Manoush Zomorodi investigates cutting-edge research as well as compelling (and often funny) real-life examples to demonstrate that boredom is actually a crucial tool for making our lives happier, more productive, and more creative. 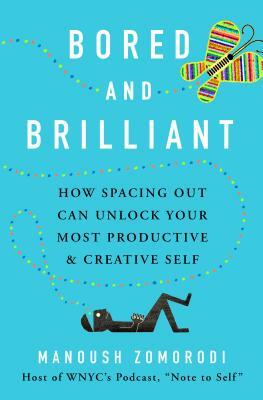 What’s more, the book is crammed with practical exercises for anyone who wants to reclaim the power of spacing out – deleting the Two Dots app, for instance, or having a photo-free day, or taking a 'fakecation'." "Bored and Brilliant is full of easy steps to make each day more effective and every life more intentional. Manoush’s mix of personal stories, neuroscience, and data will convince you that boredom is actually a gift." It’s time to move “doing nothing” to the top of your to-do list. In 2015 Manoush Zomorodi, creator of WNYC’s popular podcast and radio show Note to Self, led tens of thousands of listeners through an experiment to help them unplug from their devices, get bored, jump-start their creativity, and change their lives. Bored and Brilliant builds on that experiment to show us how to rethink our gadget use to live better and smarter in this new digital ecosystem. Manoush explains the connection between boredom and original thinking, exploring how we can harness boredom’s hidden benefits to become our most productive and creative selves without totally abandoning our gadgets in the process. Grounding the book in the neuroscience and cognitive psychology of “mind wandering” what our brains do when we're doing nothing at all—Manoush includes practical steps you can take to ease the nonstop busyness and enhance your ability to dream, wonder, and gain clarity in your work and life. The outcome is mind-blowing. Unplug and read on. MANOUSH ZOMORODI is the creator of WNYC's podcast Note to Self and the co-founder of Stable Genius Productions, a media company with a mission to help people navigate personal and global change. StableG uses podcasts as a lab to test new ways journalists can educate, entertain, and inspire through narrative. Investigating how technology is transforming humanity is Manoush's passion and expertise.